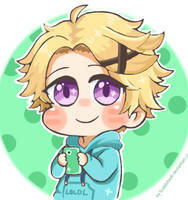 oh gosh, I just got into mystic messenger and now I'm in loooove with yoosung! he looks so cute the way you made him~! ^^ well done! I know! I love him so much too!!! >w< Thank you for liking him! Thanks! There's been quite a bit of interest in them so I'm planning to open commission slots after I finish plushing all the RFA boys. I'll make an announcement when my commissions open. MUST SAVE UPPP!! ur plushies inspire me to save money! xD that's a first!~ anyways, thanks for making these! i'm gonna save up as much as I can to purchase at least one! Thank you so much!!!! I'm so happy you like them!!! THESE TWO ARE PRETTY AMAZING, did you make them? Yep! Thanks for liking them! I was curious, who are these two? Aww thanks so much!!! And these two are from the popular phone game Mystic Messenger by Cheritz! I don't think I have seen nor heard of it, is it any good? Yes! I'm a huge fan! Awesome, in a nut shell, what's it about? these are so cute ;; i cant wait to see the other boys! Aww, thank you so much for liking them! ^___^ I can't wait to see how the others turn out too! thank you so much! I'm so happy you like them!!!! Oh! I know how that feels! The first step's the hardest though! It gets easier once you get going I'd love to see chibi plush keychains, they'll be so cute! ooo exciting!!! can't wait to see them!